How many times do you walk into the grocery store and come out with only what you needed? You have your list and your coupons and the weekly flyer! You’re armed with knowledge and determination to save money and only buy what is necessary for the week!! You’ve got this! You have a plan! Your recipes for the week are planned and you know exactly what you’re gonna get! Be proud of that shopping list! Until, you see that “new” product that seems to be at the end of every isle. It’s around every turn. It’s in the center of the isles. It’s at the check-out counters. It seems to be EVERYWHERE! It seems to be in your shopping cart. Well darn! There goes the budget! That’s what happened to me and these Oreos. I saw them and ignored them. And yet somehow, then ended up in my cart! And then they ended up in my belly. You can’t blame me really. I posted a photo on Facebook and people wanted to know how they tasted! The PEOPLE needed to know! THEY made me eat them…. really…. it’s all their fault. I liked them, but they are a bit sweet. Honestly, nobody in the family liked the Birthday Cake Oreos. I was kinda bummed, but there was a taste that I just couldn’t get over. But these, I liked. 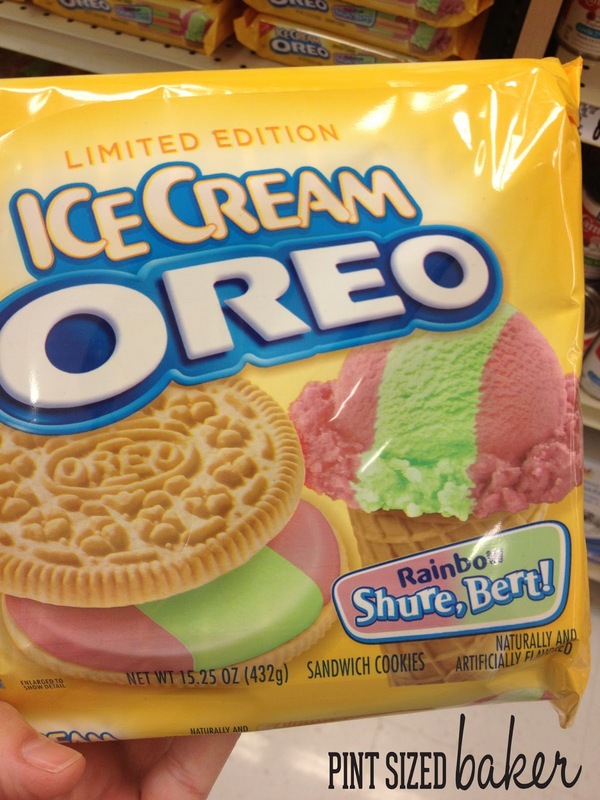 Again, kinda sweet… but that’s why they worked so well in pop form! Place 1/3 of the box of Oreos into a food processor and pulse until all cookies are crumbs. Add cream cheese and pulse until a ball forms. Scoop 1 Tablespoon size balls and place on a cookie sheet lined with wax paper. Do not roll yet, they are too soft. Place in fridge for 1 hour. Melt pink candy melts according to directions. I added Hot Pink oil based color to my light pink candy. Remove cookie balls from the fridge and roll by hand until smooth. 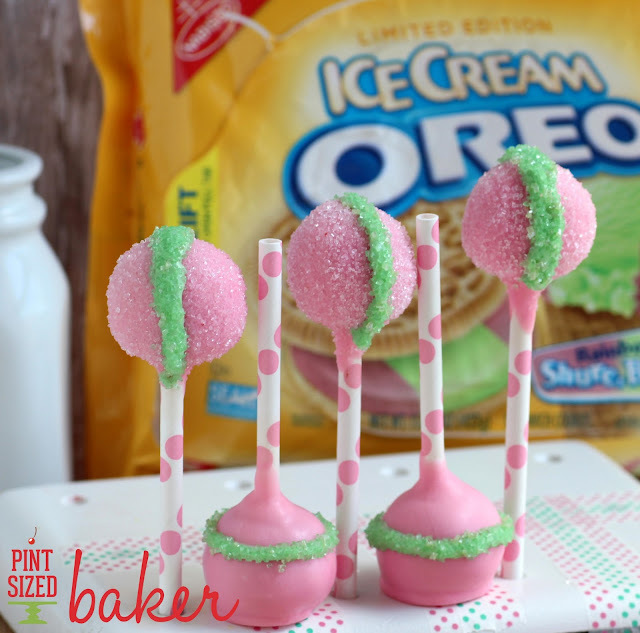 Dip lollipop stick into candy and then insert half way into cookie ball. 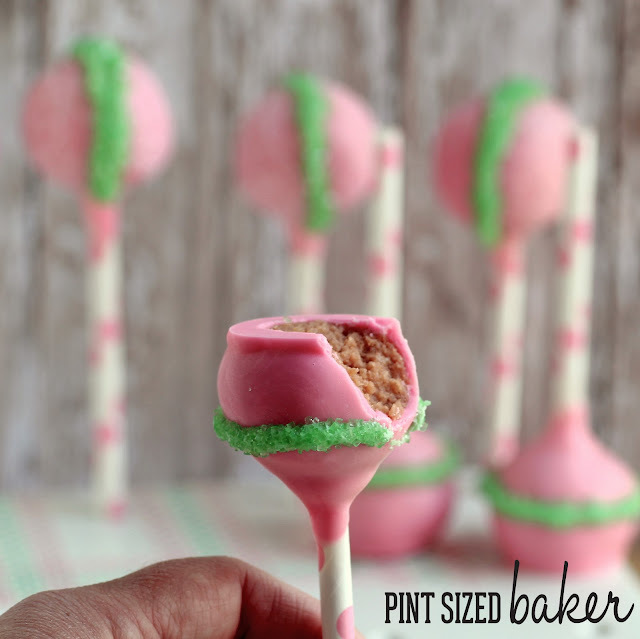 Add lollipop sticks to all cake balls. Completely dip cookie pop into candy melts in a straight up and down direction. Do not twist or turn the pop in the candy. The likelihood of it falling off is greater. If the balls feel too soft, return them to the fridge for 15 minutes. Tap off excess candy and stand up for a round pop, or place pop down on wax paper. 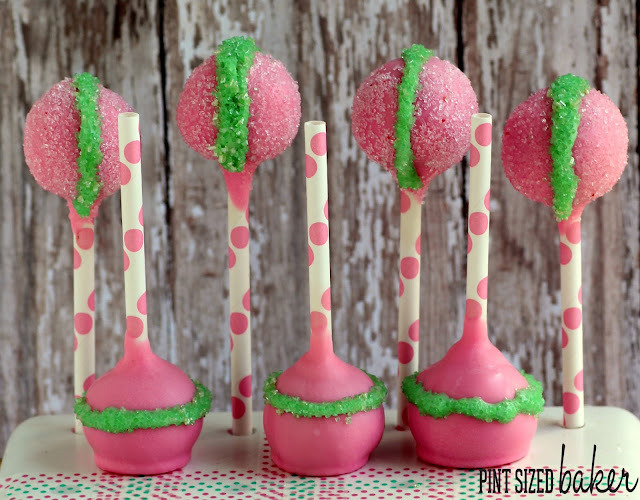 Add pink sanding sugar to the pop before the candy hardens. Complete all pops in pink and allow to dry. Melt green candy melts and pipe a line around the middle. Add green sugar sprinkles and allow to dry. This is a special treat for your child’s lunch box. Just remember, the cream cheese pops need to remain chilled, so add an ice pack to their lunch box.